This student loves coming to class every week to talk about her weekend, things she ate and future plans. She enjoys borrowing books from the library and reading them at home for practice. This week, she worked on asking if someone wants one thing or another. She understood the concept of “or”, but she had questions about when to use “a/an” or not to use it. For example “does he want an orange or an apple?” versus “does he want pasta or steak?” The teacher explained it to her and she did more examples and showed she understood it. She is also taking the Eiken 5 exam in January, so the teacher worked on Eiken with her as well. This student is currently working on improving her math skills in English. This week she worked on defining many Math terms such as “pyramid”, “integer”, and “symmetrical”. This student has made exceptional progress with her abilities to use English words to define her math vocabulary. This is a very advanced and difficult skill and she has progressed significantly! This student also worked on grammar homework, which included practicing plurals, synonyms, and adjectives. She has also made great progress in her English Grammar skills and general English abilities to write more cohesive and interesting sentences! Great job! This group of students did a great job participating in the songs and activities this week. They started out the class with circle time. After their circle time song they greet each other and say hello. The teacher asked the students how they are and the students respond with emotions like “happy” “sad” and “sleepy.” The teacher also has flashcards where they pick a random emotion or feeling, such as “hot” and “cold” and everyone has to guess what they think it is. The teacher read a book about school to the students and then introduced the new letter, “Bb”. They learned the words “bird”, “baby”, “book” and “boy”. Most of the students knew the words by the end! The students worked on making a school book this week. They colored the front of the book, which was a picture of the school. They also worked on the first page, which was a drawing of themselves. The page said “Me in 2018”. The books are going to stay at the school and they will add pages each week and for the holidays. They had a lot of fun! Lastly, the students played lots of games! They played a racing game where they had to choose the correct school item and place it in their team’s basket. They also played an ABC game where they had to say and collect the alphabet flashcards. They had a lot of fun and learned a lot! These students worked on the letter “Bb” this week. They learned the words “bird”, “baby”, “book” and “boy”. They did a really good job remembering the vocabulary for “Bb”. The students practiced writing the letter “Bb” by writing words that start with “B”, like “Bat”. The student`s handwriting continues to improve every week. The students also played a game called “hands on your head”, where they look at four different letters of the alphabet, and when the letter is called out they try to be the first one to slap the letter. They had a lot of fun and it also helped the students learn the letters even better! Lastly, they played a memory game with school words. 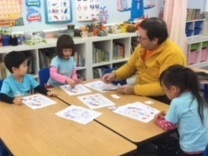 They know almost all of the words now and are able to say them very fast when they practice the flashcards. They had a lot of fun this week! This student has continued to make excellent progress with her studies to prepare for her school applications and English tests. She has been studying vocabulary in order to improve her writing as well as improve her reading capabilities. This week she learned how to create interesting topic sentences to hook the reader’s attention. She has really improved her writing skills so far and is making progress with sentence structure, as well. She is also learning how to understand vocabulary words she doesn’t know by using context clues, as well as creating her own sentences that helps the reader understand what the meaning of the vocabulary word. Her overall understanding of English has really improved! that she read. She did a great job reading out loud and understanding the essay. vocabulary this way. She then learned how to use them in sentences. word. She is off to a great start! This student loves talking about her weekend, her plans, what she ate and anything else that happened to her at school and room. She is able to hold long conversations with the teacher. This week, she read a new book about a big turnip. Again, the book repeated a lot of the words, but she had fun reading the story and answering the questions the teacher asked. Next, she worked on a phonics page. She reviews the same eight words and puts them into different sentences. Finally, the teacher tried teaching about proper nouns and regular nouns. It was a little tougher for her, so they will keep working on it more next week. These students worked on the letter “Bb” this week. They learned the words “bird”,“baby”, “book” and “boy”. They did a really good job remembering the vocabulary for “Bb”. This student loves talking about her school life, her weekend and her love of stationery items. She often brings her new things to show the teacher. She is a very smart and well spoken student. This week she worked on reading a list of items that happened and she had to put them in order. Once that was done, she had to write a title, a topic sentence, all of the details in order and then a closing sentence. She needed help putting the items in order, so the teacher assisted her with asking questions such as “what do you do first?”. With those hints and clues, she put everything in order and wrote the paragraph.